Karuna Pande Joshi is an Assistant Professor (tenure track) of Information Systems (IS) at UMBC and her primary research area is Data Science, Cloud Computing and Healthcare IT systems. Before this, she was also an Research Associate Professor in the Computer Science and Electrical Engineering Department at UMBC. She teaches courses in Cloud Computing and Big Data, Software Engineering and Database Design. 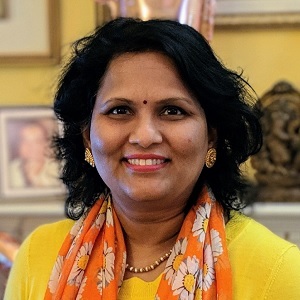 She received her MS and PhD in Computer Science from UMBC, where she was twice awarded the IBM PhD Fellowship, and her Bachelors in Computer Engineering from the University of Mumbai, India. She is the UMBC site director of Center for Accelerated Real Time Analytics (CARTA), an NSF sponsored IUCRC center. She is the director of the Knowledge, Analytics, Cognitive and Cloud Computing (KnACC) Lab in IS and is also affiliated with UMBC’s Ebiquity Research Group. Dr. Joshi also has extensive experience of working in the industry primarily as an IT manager. She worked at the International Monetary Fund for nearly a decade. She has also worked for MORENet, Missouri and Silverline Industries Ltd. in India. Her managerial experience includes IT portfolio management, program/project management, and change management. Her extensive industrial and research experience provides her a deep understanding of the practical issues faced by organizations that are transitioning or plan to move their IT systems to the Cloud.